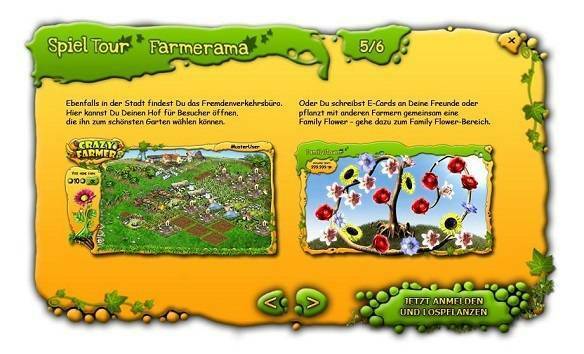 Farmerama is a Free to Play browser-based game MMO, free to play, mmorpg where you live as a humble farmer. Make the best of life and carefully tend your greatest asset: your land. There's a farmhouse, barn, mill, water tower and manure pile on this field for you to use. Breathe in the fresh country air and starting farming. There’s lots of work to be done and no time to rest! Your field is divided into a grid. On this grid, you can farm your land, plant trees or raise animals (see “Livestock” for more info about animals). Ready to play directly in your browser MMORPG, try to visit the city. It is the source for all your farming needs. You will find seeds, animal housing and trees here. You can sell your produce for a good price and trade with fellow players at the Farmer’s Market. You can pick up your mail and send packages at the post office, or visit the bank and make a deposit to your account. If you sign up to become a premium farmer, you can visit the lookout tower to get either a lookout or haverster to lend you a hand of the farm. Get your hands on the Premium Pack and earn some game leverage, like reliable customers who drop by the farmstead every day and order twice as much. or more customer orders (20 instead of 12 per day).